Rosen Hotels & Resorts’ leisure properties are offering a Leap Year deal so amazing, it can only happen once every four years. When guests stay at least one night Feb. 28 at the special rate of $79.99 plus tax, they’ll stay the night of Feb. 29 at no charge. This special Leap Year “extra day, extra savings” offer is available at all four of Rosen Hotels & Resorts’ value-priced, AAA Three Diamond properties, including the Quality Inn International, Rosen Inn closest to Universal, Rosen Inn at Pointe Orlando and Clarion Inn Lake Buena Vista (LBV). Accommodations at each of the hotels include a deluxe room with two double beds featuring Simmons Beautyrest® pillow top beds, microwave, mini refrigerator, electronic safe, coffee maker, hair dryer, iron, ironing board, work desk, free WIFI access and free 24-hour secured parking. To book online or for more details, visit http://www.orlandohotels4less.com/leapyear/ or call 800-999-7300 and ask for the Leap Year package. This special package rate is based on double occupancy and does not include tax. Not valid on existing reservations, for groups, during special events, holidays or conventions. This offer may not be combined with any other rate plan or discount. Each of the hotels has completed extensive renovations over the past year, including all new furniture that was made in America, as well as new carpet, window treatments, upgraded art work, luxurious pillow-top mattresses and stylish, yet comfortable bedding. Private bathrooms now feature granite finish vanity and modern decorative lighting. Each hotel also features a Kids Eat FREE program in which kids age 9 and younger eat from the buffet at no charge with each paying adult. The 728-room Quality Inn International (7600 International Drive, Orlando, FL 32819) offers two swimming pools and a children’s wading pool. Onsite dining options include The Apothecary Restaurant featuring a breakfast and dinner buffet, Topsy Turvey Lounge and the Lite Bite Mini-Market & Deli. The Rosen Inn closest to Universal (6327 International Drive, Orlando, FL, 32819) offers 315 guest rooms, a swimming pool and four onsite dining choices including Shogun Japanese Steak House, The Palms Dining Room featuring a breakfast buffet, as well as the International Pub and Lite Bite Mini-Market & Deli. The Rosen Inn at Pointe Orlando (9000 International Drive, Orlando, FL 32819) offers 1,020 guest rooms in six high-rise buildings. Three swimming pools and a sports bar offer downtime from the theme parks. Dining options include the Plaza Garden Restaurant open for breakfast and dinner, Zebra’s Sports Bar, Smoooth Java Coffee Bar™ & Gifts proudly service Starbucks® and Lite Bite Mini-Market & Deli. Guests who need to do a little work while on vacation may also take advantage of the hotel’s business center. 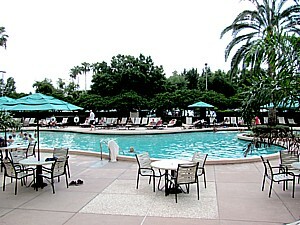 The Clarion Inn Lake Buena Vista (8442 Palm Parkway, Orlando, FL 32819) features 640 guest rooms in four high-rise buildings as well as a playground and two swimming pools, one of which features the new “Ozzie the Otter Splash Zone.” Dining options include The Boardwalk Buffet Restaurant featuring breakfast and dinner buffets, Comfort Zone Bar & Grille and Lite Bite Mini-Market & Deli. The hotel offers guests complimentary scheduled shuttle service to four Walt Disney World® theme parks, Universal Orlando®, SeaWorld Orlando®, Aquatica®, Orlando Premium Outlets® Vineland and Lake Buena Vista Factory Stores®(reservations required). The three International Drive properties offer guests complimentary scheduled shuttle service to Universal Orlando®, SeaWorld Orlando®, Aquatica® and Wet ‘n Wild Orlando® (reservations required). The I-Ride Trolley stops in front of each hotel, providing low-cost transportation to more than 75 stops in the International Drive attractions area. The three hotels are conveniently located off I-4, on International Drive, in the heart of the attractions area and just 12-15 minutes from Orlando International Airport.